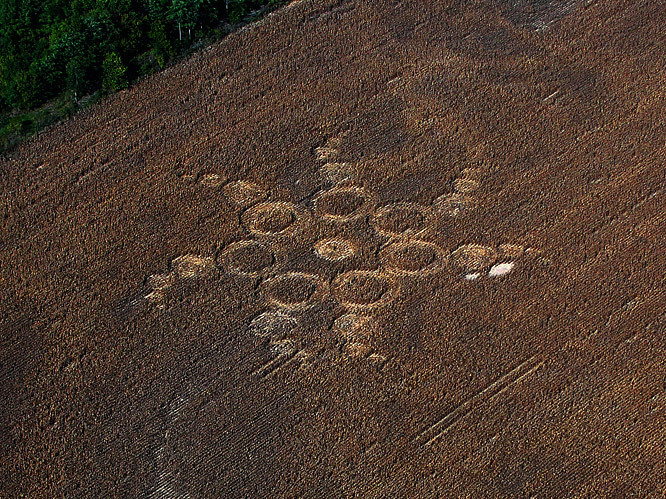 According to the ICCRA website, there have been reports of 42 crop circles in Ohio, that's more than any other state. The most popular belief & disinformation among skeptics is that crop circles are not real, but made by fakers who go out using a method known as "stomping". This usually consist of a board with rope handles attached to each end & stomping the crop down into a pattern. Another popular method is with garden rollers. Teams & individuals have been going out into the fields of southern England (as well as other countries) late at night, for the past twenty years, doing this. They supposedly do this around fifty times or more each summer, without ever being seen, getting caught, or making mistakes. Still, most media (especially here in the U.S.), typically report that it's all faked. It's also listed as fake on a lot of internet sources such as Wikipedia. However, what these sources & skeptics have neglected to acknowledge or accept, is that all faked crop circles have actually damaged the crops. Methods such as stomping & garden rollers cause the crops to be crushed & damaged, however when it's the real deal from UFOs, the crops have been changed, but not damaged. In real ones the stems have been bent, but not broken. Also, Dr. Eltjo H. Haselhoff, Ph.D., a former employee of Los Alamos National Laboratories, discovered that the plant stems inside these formations had increased in diameter, as an effect of intensive heating, with an astonishing circular symmetry. This effect also perfectly matches the radiation pattern of an electromagnetic point source at a height of four meters and ten centimeters above that field. He says, this supports the contention that the formations were created by the balls of light that witnesses have claimed to see at crop circles. Genuine crop circles also have been found to have a an energy field associated with them, while the faked ones do not. While the energy at some crop circles have made visitors feel bad, or sick, the energy at others have been claimed that it's a good feeling, energizing, & even reported to have healed people. been able to explain this, nor has it ever been duplicated by a human being. Witnesses such as an artist "Tree Pruitt", have actually claimed seeing lights in the sky that were moving in a certain pattern. This pattern was then drawn out on paper. The morning following, the new crop circle pattern was found below where the unknown light (ufo) was seen. One such case was in Portsmouth, Ohio. 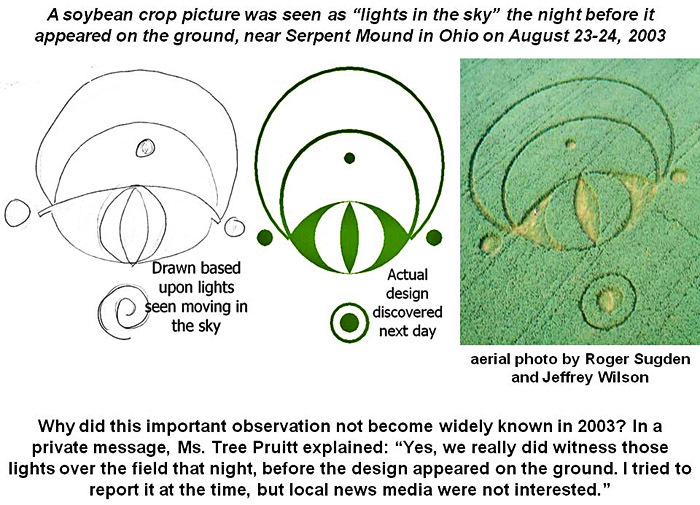 The lights were seen in the night sky over Serpent Mound, Ohio on August 23, 2003, and then the pattern was discovered again that following morning in a soybean field on the ground. And at 11:00 p.m. on August 22 in Hillsboro, Ohio, an enormous object was seen in the eastern sky. Cincinnati UFO Investigator Donnie Blessing was told that multiple witnesses observed a circular object that had a rotating set of white lights around the center, with one of the lights shining down on the ground. Two days later a crop circle was discovered in a soybean field across from the legendary Serpent Mound Indian Burial Ground in Adams County. On May 3rd 2003 in Flemingsburg, Kentucky, a crop circle appeared in a rye field along Tea Run Road. According to the witnesses, including Fleming County Sheriff Jerry Wagner, the donut-shaped formation was a perfect circle 50-yards in diameter. The report appeared on the local Ohio news & in local newspapers. Some sources of info on this subject can be found on the links below. http://www.youtube.com/watch?v=Ygl3hs2JdKA - Shows how the local crop circles are in a straight line with each other. http://www.cropcircleconnector.com/inter2012/USA/hopewell2012a.html - Recent 2012 Chillicothe, Ohio crop circle. 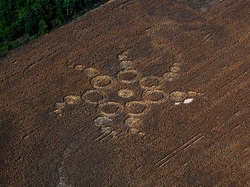 http://www.chillicothegazette.com/apps/pbcs.dll/article?AID=2012210010306 - Chillicothe Ohio crop circle news paper report. http://www.bltresearch.com/usacropcircles/ - List crop circles by year found. http://www.ufosightingsdaily.com/2014/06/newest-crop-circle-in-england-on-june.html - A great informative site giving up to date info on crop circles & UFO sightings. 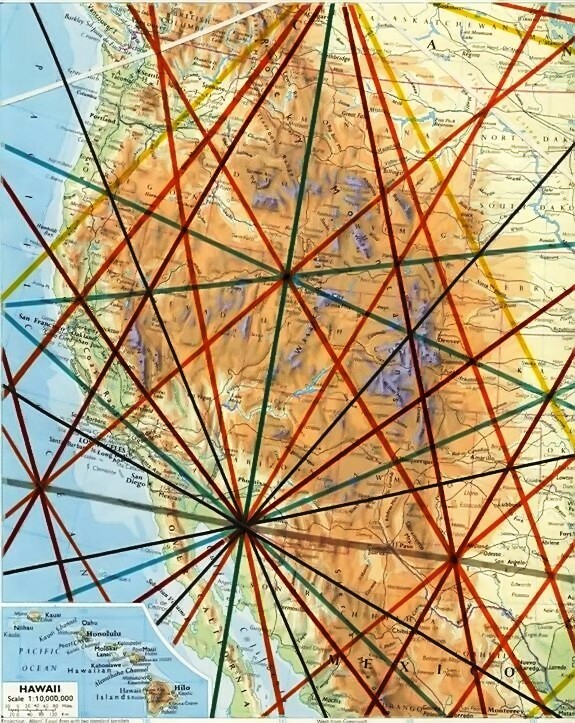 Below is a map of ley lines. 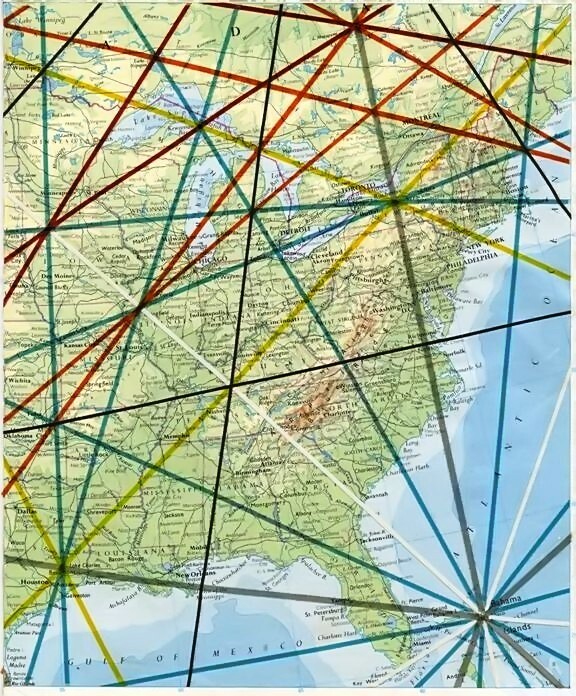 Ley lines are straight energy lines crossing the landscape. When energy lines are straight they have a fast and strong flow of current, for example when wiring a house you have to make sure that the wires stay straight & does not contain to many twist or kinks. Being near a ley line is kind of like plugging into a high voltage source. Some people report that they have increased psychic abilities in these areas, while other people have trouble handling the high amounts of energy & report feeling sick. In feng shui the strong flow is considered to be dangerous for living beings. Many paranormal investigators have found an increase of paranormal activity along these lines. It has also been found that many times crop circles as well as sacred & mysterious structures such as the great pyramids have been built along or near these lines. http://www.youtube.com/watch?v=i_sci7G-Z3Q - This is a link to 2012 crop circles in the UK. http://www.lyssaroyal.com/freport11.htm - Very informative site from Royal Preist Research concerning crop circles.